Window washing. When is the best time of year for it? Home / Window Cleaning / What Time of Year Is Best for Residential Window Washing? Window washing, or window cleaning as you may call it, is an essential part of keeping your home beautiful. As the seasons come and go, you might be wondering when the best time to clean the windows is. The truth is, it’s always a good time to have your windows professionally cleaned. Spring is known as the season of cleaning, and for good reason. Pollen and tree sap often accumulate on windows during spring, creating a sticky film on the glass that can be unsightly. With residential window cleaning methods, like pressure washing, all that pollen and grime will get blasted away, making your home sparkle like new. Window washing is the same. Some homeowners might hesitate to schedule professional window washing services during the rainy season, however, rain doesn’t make windows dirty. Rain drops evaporate and will not leave water marks behind. But, if the windows are already dirty, rain can cause spots, which is why it’s always a good idea to keep windows clean year-round. When summer and fall approach, you’ll likely be getting ready for outdoor entertaining and other get-togethers. What better way to prepare your house for visitors than with residential window cleaning? It’s sometimes difficult to get rid of grime in hard-to-reach areas, but professional window washers have the skills, equipment, and expertise to handle the job for you, so you can focus on party planning. The only time to avoid professional window cleaning is during storms when there is lots of wind present. This is because the wind can blow dust and debris against the glass. But, even in winter, homeowners can benefit from residential window cleaning and pressure washing treatments to keep their homes looking great. 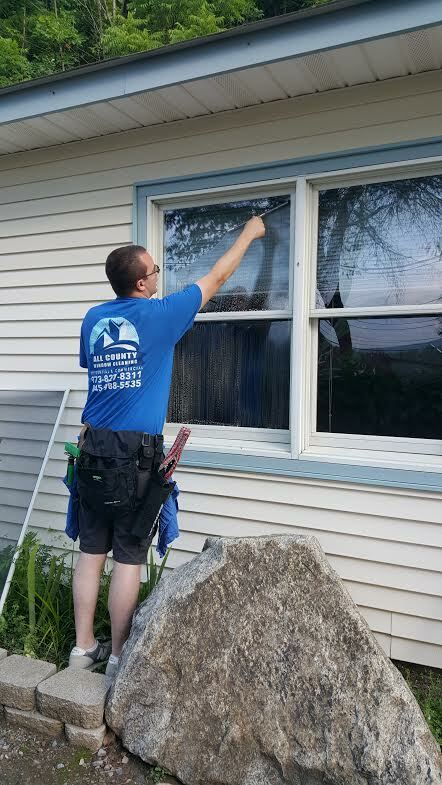 For residential window washing in the Vernon, NJ, area, reach out to the experts at All County Window Cleaning. We are a local company that provides exceptional service, and we offer a 100% satisfaction guarantee on our work. Call us at (973) 827-8311 to speak with a friendly team member or click here to contact us.